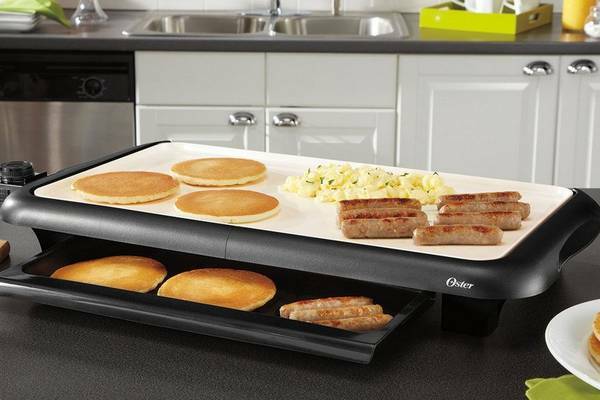 The Oster CKSTGRFM18W-ECO DuraCeramic Griddle is a compact and attractive unit, with an off-white ceramic coated heating tray set in an elegant black curved base. Below it is a warming tray in a pull-out drawer. Cool-touch carrying handles are built into the side of the base, making it a convenient and stylish way to bring hot food to the table or buffet for serving. 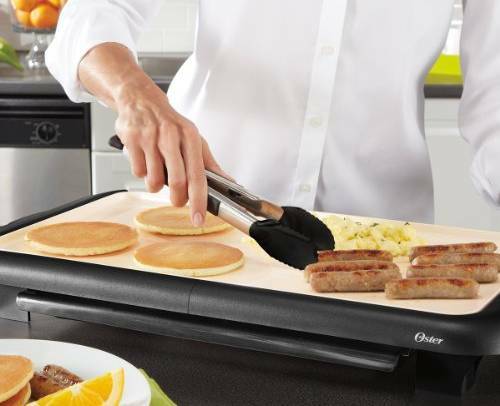 It's the most affordable of the Oster DuraCeramic griddle range, featuring an advanced, durable ceramic surface with strong environmental credentials. It's claimed to build and distribute heat better than standard non-stick coatings, be easier to clean and more scratch and damage resistant. We've examined online reviews and ratings from multiple trustworthy sources to inform you what it's like to own and live with. The heating surface is a DuraCeramic coated cast aluminum tray measuring 18 by 10 inches, large enough to cook a family sized breakfast or stack of pancakes. Six French toast slices will fit, and two or three more can be kept warm in the warming tray that pulls out from below. The ceramic coating is natural, made without PTFE and PFOA chemicals, and is claimed to be four times more durable than convential non-stick coatings. Certainly the majority of users found it easy to clean and cook with, though some raised question marks about the durability of the finish. 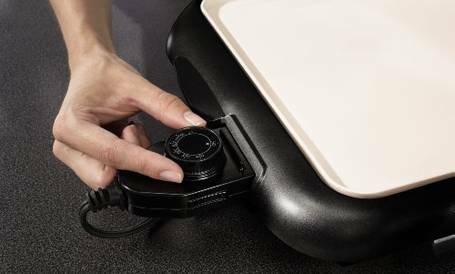 A temperature control probe and control knob plug into the side of the griddle, and can be removed to clean the outer case of the grill in water. Besides an on/off switch and keep-warm function, the control has a temperature scale between 270 and 420 degrees. Users found the ceramic coated tray particularly easy to clean. It lifts out and can be submerged in water or put in the dishwasher. Most times it doesn't need that, and a simple wipe down with water and paper towel is enough according to many reviews. One or two add that cleaning is easy "as long as you clean it straight away" or "use the proper solutions" naming specific cleaning products or baking soda. Many buyers were impressed with the ceramic coating's performance and slippery non-stick qualities. Several are happily warming pancakes up with no oil or spray whatever. The warming tray is a popular feature to "store pancakes for the late sleepers" as one reviewer puts it, and makes the most of the grilling area available. Some buyers were disappointed to find their ceramic cooking surface showing burn marks and discolored patches after only a few uses. They found that where food had burned while cooking, it was impossible to remove the stains left behind. Another experienced flaking in the ceramic coating after only a few months. Others found evidence of heat damage to the tray inside. Signs of warping and even melted plastic suggested a flawed or malfunctioning design. A few users had doubts about the accuracy of the temperature scale. They found pancakes burned easily when cooked at the indicated recommended temperature of 350 degrees, or that the tray didn't reach close to the temperature indicated by the dial. This is an attractive looking electric grill, and some retailers' deals make it a very affordable way to acquire a premium Oster DuraCeramic griddle product. The ceramic cooking plate is a good size, heats fast and cleans up well, and resists sticking especially when new. Including a warming tray in the design is a neat and practical use of space and heat that would otherwise be wasted. Unfortunately, some of the parts and materials this model appear to be manufactured down to a price. The ceramic coating doesn't seem too consistent or durable, and can apparently scratch, wear thin and burn, according to some users' posted photos. It appears care is required to follow some detailed cleaning and preheating instructions, which can help avoid trouble, but just scrubbing burnt-on food can be disastrous. The drip tray and drawer are made from hard plastic. This gave off some unpleasant chemical aromas on first use for some buyers. Another worry is a few reports of base units and bottom trays showing heat related damage, that casts doubts on the materials chosen for this Oster griddle. Oster seems to be responsive and eager to provide good service when honoring their one-year limited warranty.